Stop right now with what you are doing and pay some respect to the Ancient Ones from Italy. 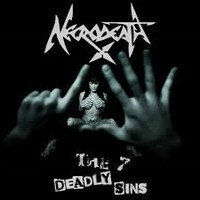 Yes, NECRODEATH is an old and savage warhorse in service of Metal since 1984, and these guys really where intense back on 1987 (when your Ol’ Big Daddy here heard their first album in an old tape), as they are here on their new album, “The 7 Deadly Sins”. No, forget some newcomers who try to play Thrash / Black Metal, for these guys are here as honest and nasty as they were back then. Obviously the years passed, the band had some problems and hiatuses, but their raw and abrasive energy is untouched. And mind you all: they can turn your ears into bloody spots with their old KREATOR-like music (but they have personality, have this in mind). A good sound production provides support to NECRODEATH’s songs, so you’ll hear all accords and musical details with no problem at all, so prepared to forget the clones, for this is the original matrix for Italian aggression! Their best moments: the Thrash grasping “Sloth” (where the house comes down with its speed and great guitars), the nightmare made music “Lust”, “Pride” and its thundering bass and drums, “Greed” and the new versions for “Thanatoid” (from 1989’s album “Fragments of Insanity”) and “Graveyard of the Innocents” (from 1987’s album “Into the Macabre”, the same I heard on that time I mentioned above), so you can hear and feel the evolution and experience that this insane Italians have. What’s left to say? Just buy it!